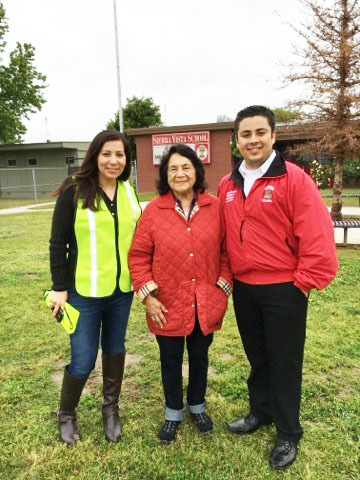 Parents, community members, and 40 school children gathered early in the morning on Monday, April 11th to celebrate the launch of the much-anticipated Walking School Bus. 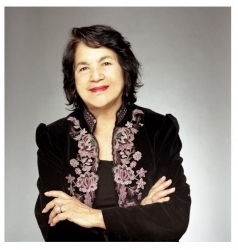 Dolores Huerta served as the main bus driver by leading the line of children holding on to hand-made, cardboard yellow school buses. 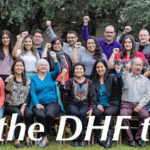 Participants included DHF Health Policy Organizer, Yesenia Ocampo, DHF President, Dolores Huerta, Arvin City Council Member, Jose Gurrola (pictured here) and Arvin Union School District Board Member Toni Pichardo. The Walking School Bus, a joint program of Dolores Huerta Foundation’s Cultiva la Salud and the Arvin Union School District, is a group of children walking to school under the guidance and supervision of one or more adults. There is a planned route with meeting points, a timetable, and a schedule for trained volunteers. The goals include: 1) Promote healthy lifestyles by encouraging children and adults to be more physically active. 2) Make it safer for children and adults to walk in the neighborhood. 3) Build community by helping neighbors get to know one another better. This is the first of it’s kind in Arvin and Kern County. 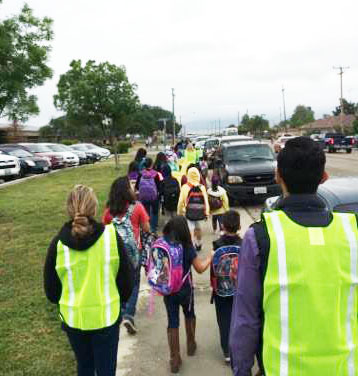 It was such a great success that Rosemarie Borquez, Sierra Vista School Principal, has committed to organizing a Walking School Bus on a daily basis.